The annual event to celebrate bountiful harvest has now been kicked started. The 2012 Harvest Festival launching was in Kuala Penyu in an effort to give all major towns the opportunity to become the host for one of the widely celebrated cultures in Sabah. Last year, 2011 Harvest Festival was kicked-start in a small West Coast town of Tamparuli. In this newspaper cutting form Daily Express, Sabah Chief Minister Datuk Seri Musa Aman (right) is seen cutting stalks of rice on stage to mark the launch of the Pesta Kaamatan 2012 (Harvest Festival), witnessed by Deputy Chief Minister Tan Sri Joseph Pairin Kitingan (centre) and Beaufort MP Datuk Seri Lajim Ukin (left). High priestess Kinup Suram meanwhile, performs the blessing ritual. The month-long celebration starts 1st May, 2012 and as usual will be capped with a full 2-day extravaganza at KDCA in Penampang on 30th-31st May 2012. 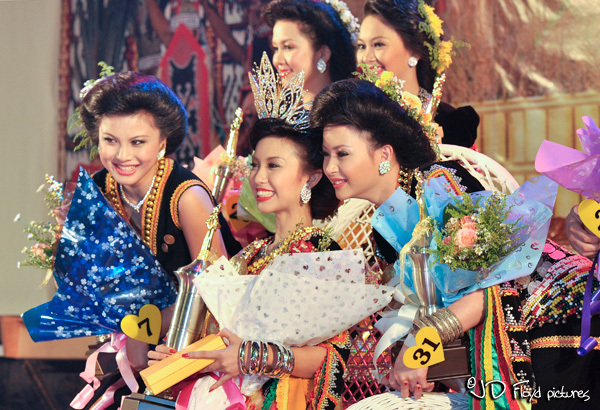 The peak of the celebration is marked with the crowning of the Unduk Ngadau (Harvest Queen) for 2012. May & June are the two busy months for Sabah & Sarawak. a time to celebrate and rejoice. Wonderful photos of this beautiful celebration and joyful time! Happy Harvest!